Today we got the news we have been waiting for literally over a YEAR to receive. Will we be moving and if so when/where? When Paul and I first started dating in August of 2010, we knew that he was ending his term as a recruiter for the Army within the next year or so and that would eventually mean a possible move. Right around the time we got engaged (December) we had to decide which direction he was going to go. Apply to become a “full-time” recruiter and eventually convert into a station commander OR end his recruiting term and go back into the “regular” army and back into the job he had been doing for the 14 years or so before he became a recruiter. It was one or the other and there were pros and cons to both. We decided he would move forward with the application for station commander. It meant that he would most likely be non-deploy-able for his remaining few years in the Army. It would also challenge him in his career and put him out of his comfort zone. If we thought making that decsion was hard, actually getting the application completed was seemingly impossible. We thought in January 2011 that by the wedding (June) we would be far along into the process and might actually even know where we would be assigned. After wedding and honeymoon and moving in together and all that jazz, around four months later, progress was made. We were confident that it was all God’s timing. Packet submitted, process started, station commanders class (one month long) scheduled for November. We should know where we are headed during or right after the class FOR SURE right?!? Psshhhh…are you kidding me? No way. Come to find out that since his time as a recruiter was essentially up, he was put back on orders for his “old” job in the “regular” army b/c no one told that group that he was already in the process to convert to station commander. We figured they would take care of it. Those orders will for sure get deleted, he had already gone to the training class for goodness sakes. NOPE. That is way to logical. Another two months goes by. Waiting. Trying to find the right people to talk to the right people. Waiting. The boss’s boss’s, boss’s, boss needs to talk to that guys boss’s, boss’s, boss’s, boss. Easy enough right? Waiting. No response to emails. Waiting. Emails get deleted without being read. Waiting. Praying. Trusting in God’s plan. Relaxing in the fact that He has all of this under control. He is not surprised. He has our best interest at heart. He will not abandon us. Finally last week, a breath of hope. A “big wig” comes to Paul’s office for an inspection. Paul talks to him. He gets fired up and then gets on the horn and promises an answer by next week. Yesterday was next week. He followed up. Those orders will NOT be deleted. No idea why, but it is what it is. We will be going to Ft. Carson Colorado Springs in early May. FINALLY an answer. Praise God. While this means that all the work Paul did to convert to a station commander is essentially, in a way, a waste of time and he will not be doing a job that he is trained to do, I look back on the past year and see God in everything. The eight months or so it took to actually get the packet started and in the process gave us all that time to plan and enjoy our wedding without having to worry with the additional stress of Paul potentially having to go out of town to school. The joy that we experienced once we knew he was scheduled to go to the class and making that progress that we had waited so long to see. That was a real blessing. The time that Paul was gone for the month, although hard, gave Kyle and I an opportunity to know each other better in a way that wouldn’t be possible otherwise. Finding out that his orders would potentially not get deleted was a rough day for me. That was back in late December early January. I don’t remember exactly when it was, but I remember feeling my world drop from under me. I had been going along all this time thinking he would convert and we wouldn’t have to bother with thinking about him getting deployed. Now I was faced with the potential that we might have to move to a new place, I would have to get a new job AND potentially be a single mother to a 13/14 year old boy who I am still getting to know. And have to face a year apart from my brand new husband. All of those things seemed completley overwhelming to me and it was NOT a good day. But after a while I had time to adjust. Time to relax. Time to give all of this to God and say, “this is to big, you need to handle it for me.” And He did. In those weeks since I found out that those orders might not be deleted, an overwhelming inexplicable peace has come over me. Even though we still weren’t sure what would happen and all of this might go away and we could proceed with him converting, I felt increasingly more comfortable with the converse. All of the positives started popping for me. I had always been fine with moving to Colorado. Even though I love everything about Seattle and hadn’t planned on leaving anytime soon, Colorado is familiar territory for me. Right up I-25 from Albuquerque and a road I had traveled often. House hunting is always fun and this would give us an opportunity to find a house that is just right for us and will hopefully greatly reduce our commute times! I don’t know yet about work, but I am confident that with my skills and background, I will be able to find something suitable. Even though we have NO IDEA if Paul will eventually get deployed, I am more and more comfortable with the idea of taking care of things if he does have to go away for a while. I already had a mini trial run the month he was gone and everything was fine. It was really hard, but everyone is still alive and happy. The time between finding out it was a possibility of moving to CS and the certainty of it has given me time to become OK with it. I actually look forward to it in some ways. That is only something that God can orchestrate and I am constantly amazed by the beauty of His plan. So there you have it. We are moving. Time to start cleaning and packing. YAY! I was going to run after work but I just couldn’t do it. As soon as Paul called me with the final answer, I felt all that pressure of the unknown instantly dissipate. Despite that, my mind has been spinning and racing all day. I was exhausted and had a headache and knew that a run would not be successful. I could not concentrate enough on it. I also have had a dull pain in my right quad (it’s never been quite the same after the summer softball issue) so I decided to scrap the run and go home and see if Paul wanted to go out and celebrate. 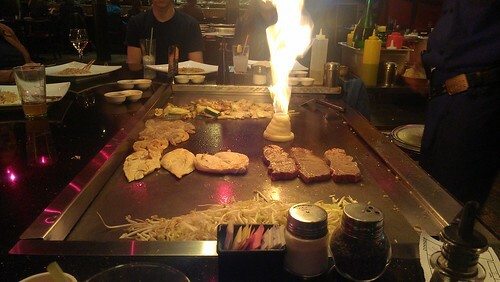 He did of course, so we took the K-man out for a teppanyaki dinner. 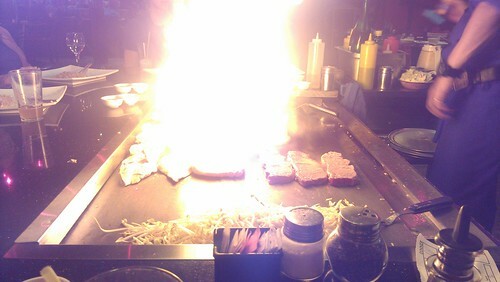 Ummm…wait a minute…that is our food that is on fire…. 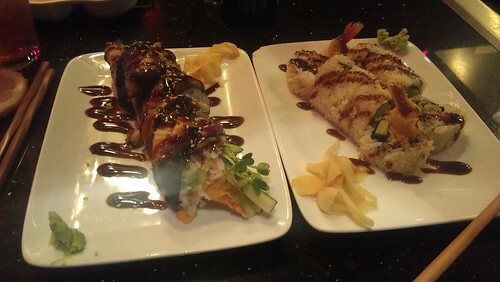 I got sushi so no worries for me! Thank you to all those who waited with us and prayed for us during this interesting time in our lives. I can’t tell you how much you all mean to me!